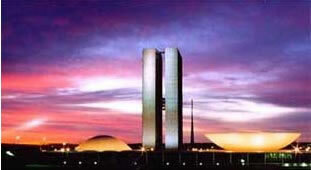 Brasília, the capital of Brazil is one of the world's truly unique cities. This city was erected in the middle of virgin territory after being completely planned on the drawing boards of worldwide known architects Oscar Niemeyer and Lucio Costa. Brasilia's geographic situation is a symbol of the political as a means as to carry Brazil into the future as a leading power in the world. The futuristic beauty of the city always fascinates tourists. Day trips from Rio de Janeiro, Salvador da Bahia, São Paulo or Recife are possible. Round trips with a day's stay are particularly popular and can be planned as a stopover between other destinations. We will be glad to help plan a sensible and satisfying visit as a stopover in a round trip. In addition to these regular excursions from Brasilia, we also offer a series of special Interest Tours to Goias State.